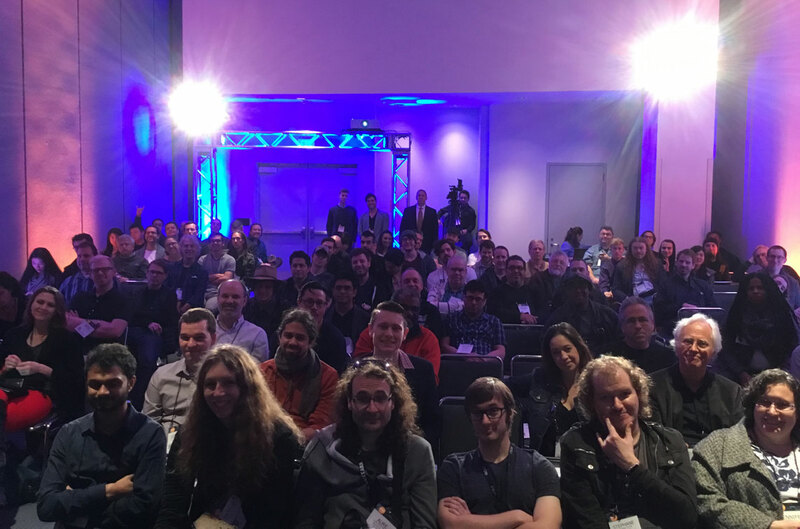 NAMM is back for software developers in more than one way, and this report took a little longer than usual because there were a lot of new things. First, traffic was up, further improving on the current trend. According to participants polled booth traffic in all the tech areas was satisfactory and heartening. 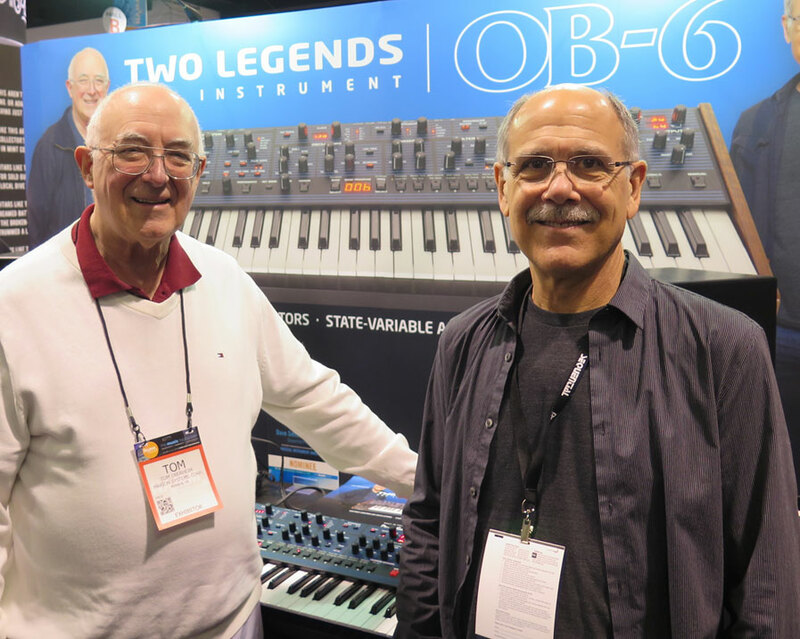 Second, NAMM is making a concerted effort to entice software companies back to exhibit and subsequently become more of a presence in the retail channel. This should be good news indeed for all concerned. Dave Rossum is back as well. 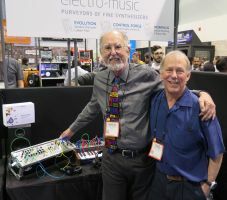 Dave was the co-founder of E-mu Systems (as well as a design contributor of the original Oberheim SEM module) and architect of many of the chips that appeared in Emu's products. 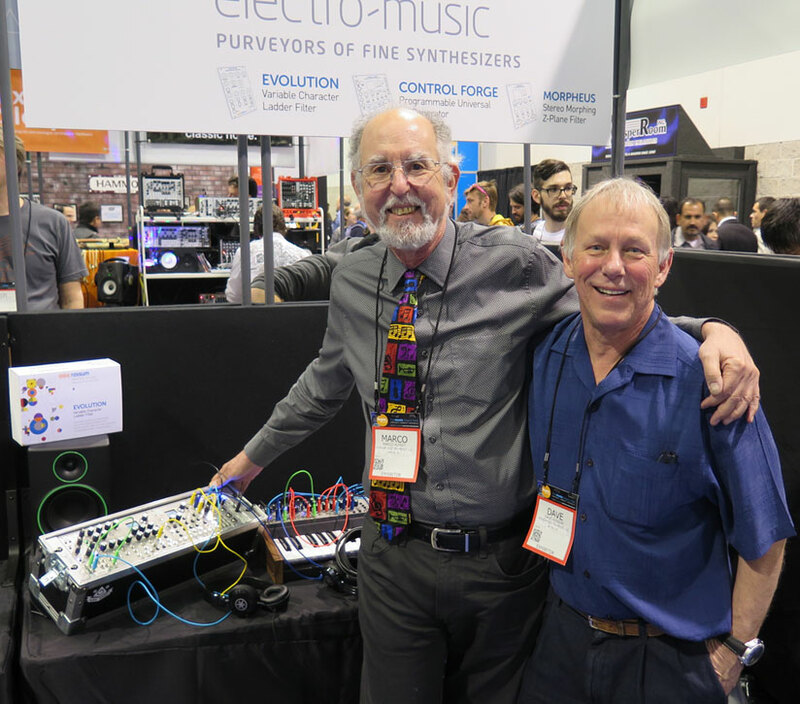 He and Marco Alpert, who was Director of Marketing at E-mu, are also back with Rossum Electro-Music. They were showing some Eurorack modules, including the Control Forge Universal CV Generator, and the Morpheus Stereo Morphing Z-Plane Filter. The first one, Evolution ($369), will ship in mid-February. Old folks will also appreciate this: Roland was showing the System-500, a fully analog modular synthesizer inspired by Roland's original groundbreaking System-700 and Systems-100M, but now for Eurorack format. The System-500 Complete Set includes: the 512 module ($349) with two voltage controlled oscillators featuring saw, sine and square waves; the 521 module ($349) with two voltage controlled filters featuring selectable high-pass filters; the 530 module ($299) with two voltage controlled amplifiers, each featuring multiple CV inputs; the 540 module ($349) with two ADSR envelopes and invertible LFO; and the 572 module ($369) with classic phase shifter, delay, gate delay and LFO. Pretty nifty if you can afford it, with Roland's exceptional sound and quality. Italy-based Chocolate Audio was showing the new Black Album drum library on both the BFD and Kontakt formats. Fans of Metallica will appreciate it. UK-based FXpansion was demonstrating the latest version of Strobe. On hand were founder Angus Hewlett and Skot MacDonald. Lucky attendees might have gotten a chance to see the latest version of Geist as a bonus. Audible Genius (catchy name right...) was showing Syntorial their, synthesizer tutorial. The curriculum is well organized, and includes ear training (what does a certain kind of filter actually sound like...) and quizzes. 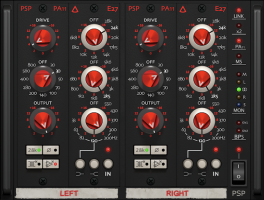 They have used several popular synth plug-ins as the basis for their teaching. 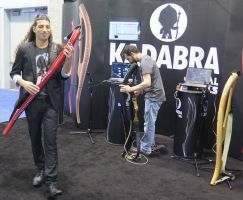 Two companies that weren't at NAMM last year were SoundToys, showing SoundToys 5 with the new effects rack, while WaveDNA, was showing Liquid Music for Live. 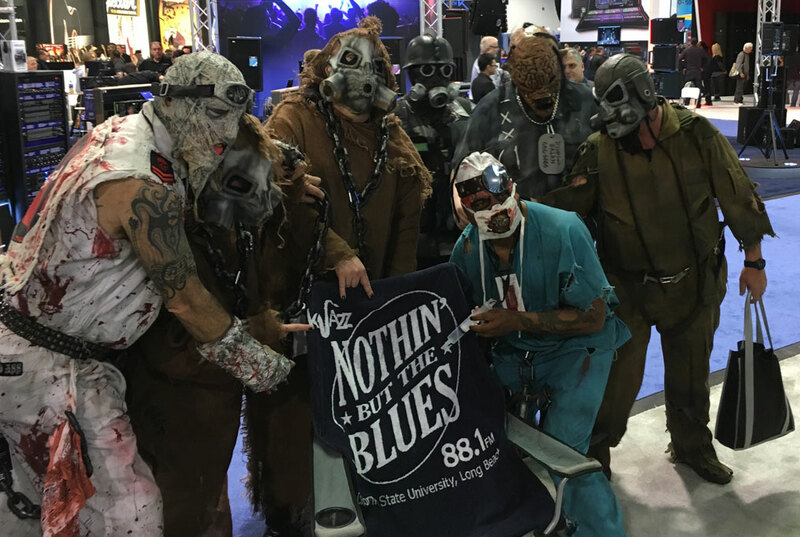 Both companies had sat out the last NAMM Show, so the Software.NAMM idea has helped them maintain their visibility at the convention. There is a new company from industry veteran Doug Morten. It's called Quparts and they have a new Kontakt library called California Keys ($199.00) that was on display. Best Service was in the room showing their latest libraries. Appearing with them was sound designer Eduardo Tarilonte. Look for an announcement from them soon. Finally there was Lumit Audio a new company that has created a new DAW application for the Windows platform, called Lumit. Lumit is a desktop music production mobile, built using a UI framework that allows them to program multi-touch hand gestures for any parameter or widget. Marketing a new DAW is a pretty bold move in 2016 and we wish them the best of luck. On Saturday KVR was pleased to moderate a discussion of the future of iOS technologies as part of the A3E event on Saturday. 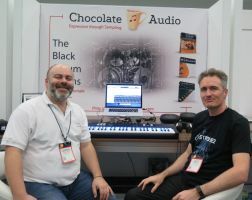 The A3E guys are making an effort to bridge between the technical and business sides of the music technology world. This is their third event, and first at Winter NAMM. The panel included technologist David Mash from Berklee College, and Enrico Iori founder of IK Multimedia, among others. 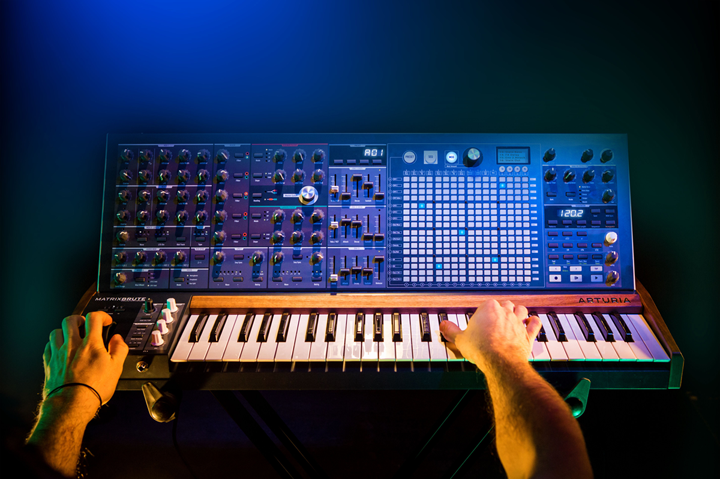 Arturia made a big noise with the announcement of the MatrixBrute ($1,999), a monster duophonic analog synth. Best learned about by clicking on the link. After some manufacturing delays they are now shipping the AudioFuse ($599) 14/14 Audio I/O box. As you would expect from Arturia both products have an attractive mechanical design. At the rate this company is moving they will likely have their own room next year. ROLI was in their own room. 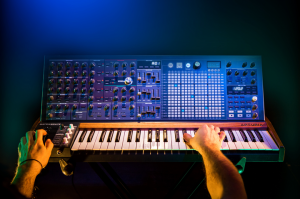 In addition to showing the two-octave Seaboard RISE ($799) that they introduced last September, they have announced a four-octave version called Rise 49 ($1199). Both are MIDI controllers that improve upon their original 2013 Seaboard GRAND, and both include a copy of ROLI's polyphonically expressive sound software called Equator. Similar to Roger Linn's LinnStrument, the foam-like surface of Rise or Rise 49 captures 3 dimensions (pressure, left/right and forward/backward) of each touch, polyphonically, for highly expressive musical performance of each note's loudness, pitch and timbral changes. Both instruments support the emerging MPE Multi Dimensional Polyphonic Expression standard for connecting polyphonically expressive controllers and sound generators. Soon we're going to start hearing more music from people who couldn't have made it before inventions like this became available. 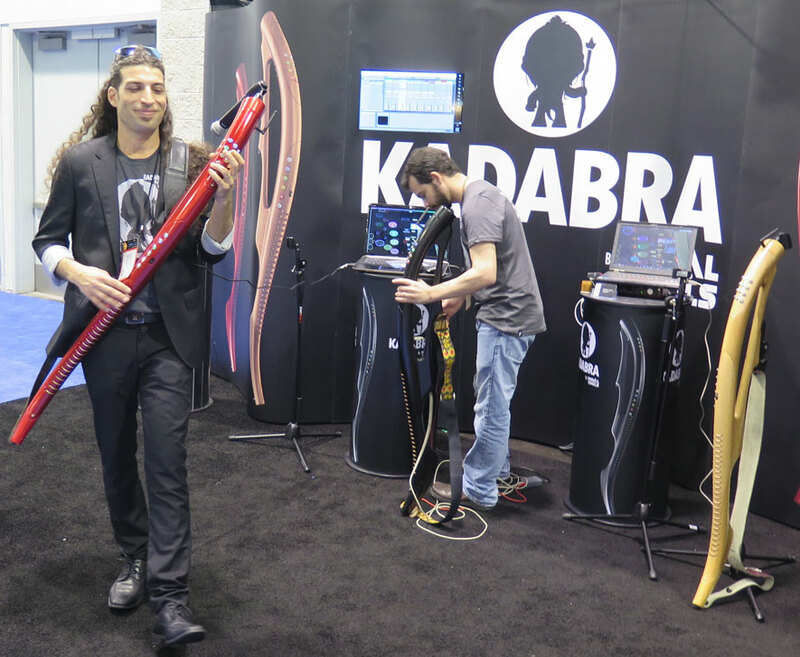 This year's nutty product goes to the Kadabra, a wireless ??? 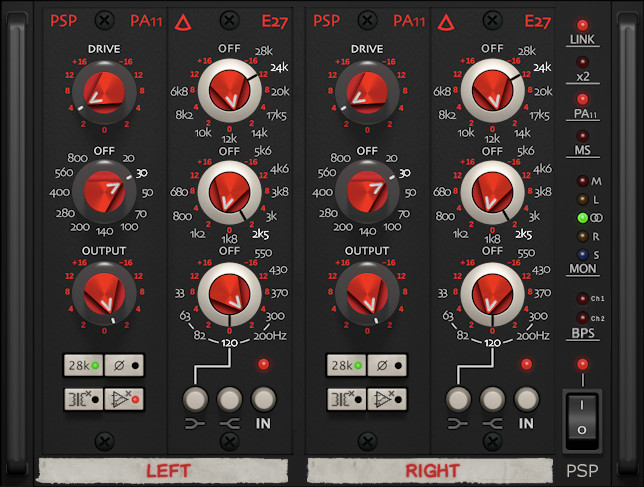 controller from Israeli company, Tribal Tools. There wasn't enough time to figure out exactly how it works, but it's made from wood, so that's worth some points. 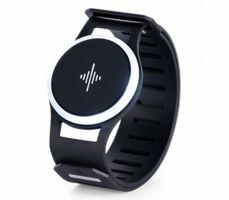 Joining the wearable electronics party is Soundbrenner demonstrating their wearable metronome ($99). It vibrates at a selected tempo, and allows the wearer to create a set list of tempos and beats. As someone that remembers going to concerts where the drummer had to put on headphones this seems like a great idea. Eventide was showing Anthology X as well a some new Algorithms for their H9 Pedal series. 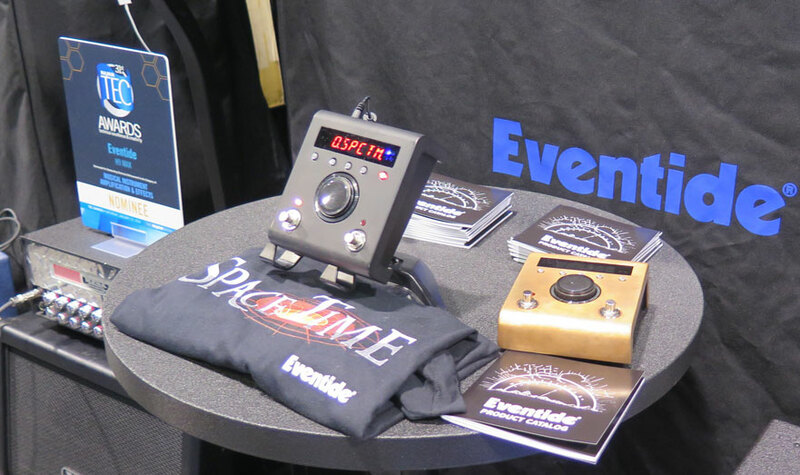 Over its rich history Eventide has marketed products in both the pro-audio and avionics markets. Recently they have decided to focus solely on the audio market, and that is going to mean more cool software and hardware products. Berlin-based Orchestral Tools was showing their Metropolis Ark 1 (€399) sound library for Kontakt. It's designed to recreate the sonic mood of Fritz Lang's epic movie Metropolis. Sci-fi enthusiasts can appreciate the first science fiction movie, the first sci-fi movie from 1927. That was a little before Alan Turing's day. And speaking of Eurorack, Waldorf has a new keyboard controller. 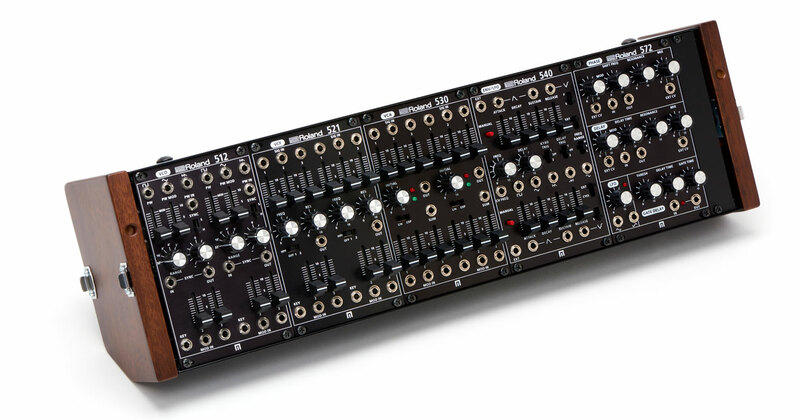 It's called the KB37 ($999) and it features a 37 note keyboard with velocity and aftertouch that can host up to 100 HP of Eurorack modules. 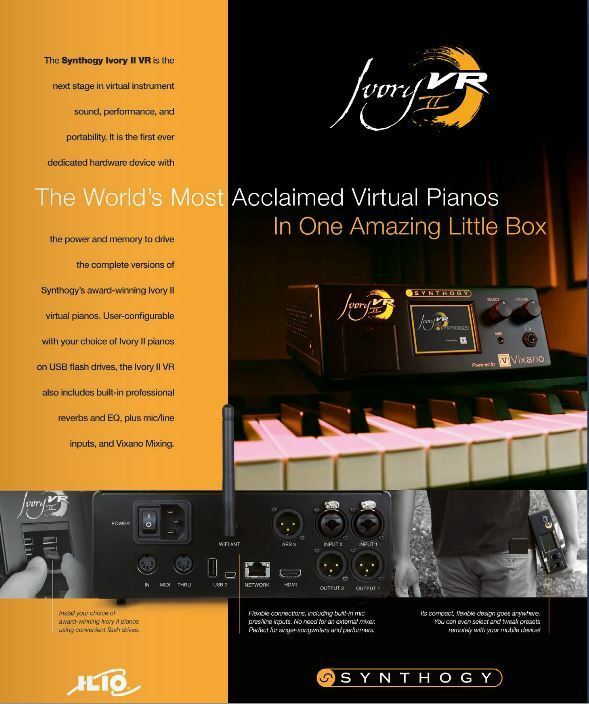 The crowd was thick in the Ilio Booth especially during the many performances that highlighted the new Ivory box, an intelligently designed hardware device that will play any Ivory piano. The pianos come on USB flash drives that plug into the front panel. 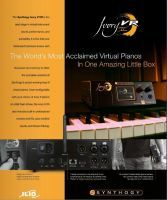 Not a lot of details available yet, but it looks like a winner for people who want to play a compact acoustic piano live, or in the studio when they want to use their computer for something else. 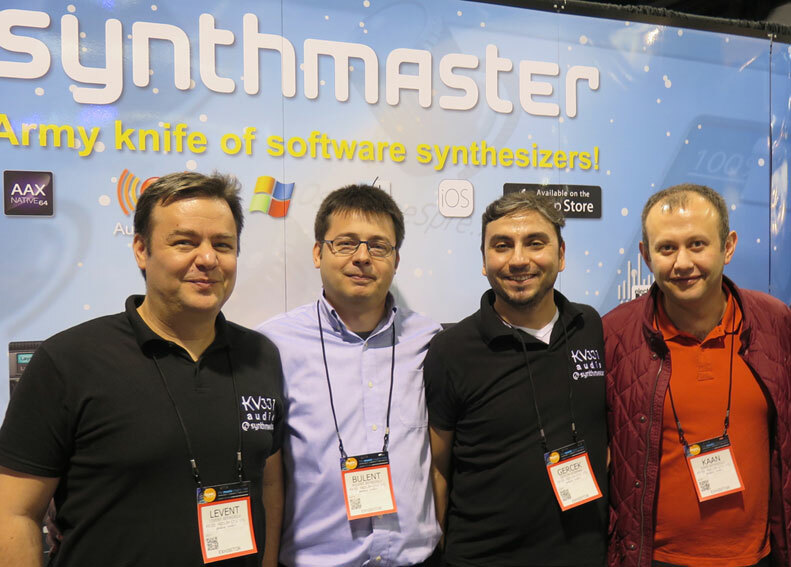 Also in the Ilio booth Applied Acoustics was showing the latest version of the Chromaphone percussion synthesizer. It uses acoustic resonators to create a variety of percussive instruments, from drums to mallets. Bulent Biyikoglu, founder of KV331 was there with his extended family. They were showing Synthmaster of course, for both the desktop and mobile platforms. Spitfire has introduced the Hans Zimmer Piano (£299), the latest in their "Signature" series. It's their fourth collaboration with the highly successful film composer. They had a huge presence, so they must be doing well with the full range of products they have. As a guitar player I'm thrilled to see Fishman's continued commitment to their TriplePlay wireless MIDI guitar platform. They've released the TriplePlay FC-1 foot controller ($199). In their booth demonstrating was Jennifer Batten, with whom I was honored to have attended GIT (um... I forget how many) years ago. Needless to say she was the only woman in a room full of guitar players at the time, but that hasn't prevented her from having a very successful career playing in bands with the likes of Jeff Beck, and Michael Jackson. And then there was the e2 De-esser from Eiosis (quick say that 5 times as fast as you can...). 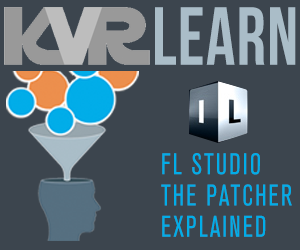 They are also contributing products to the new Slate Virtual Mix Rack, which shouldn't be a surprise because their founder is Fabrice Gabriel, who did so much work on various other Slate Digital products. 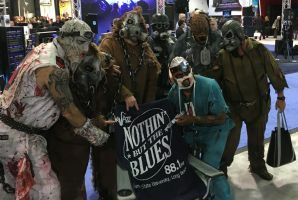 What I love about NAMM is that you never know who you will run into. 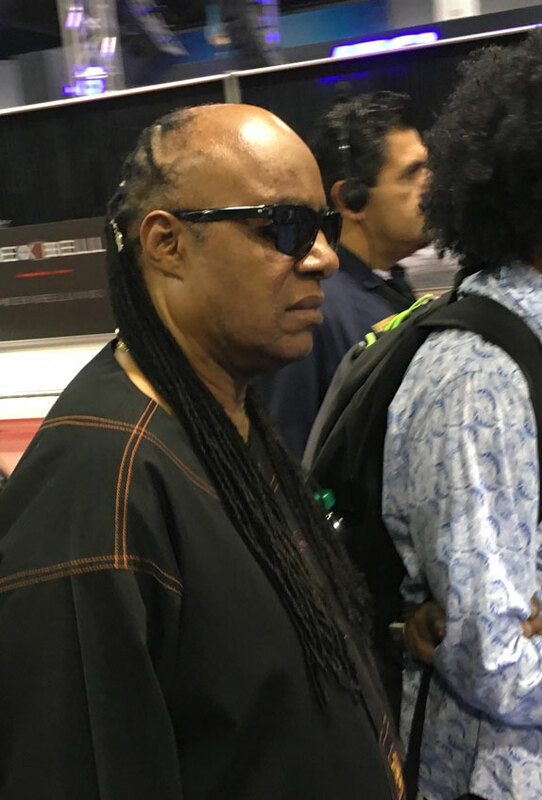 And in Stevie's case it's on you to get out of the way. Frankfurt Musikmesse 2013 - Where have all the software companies gone...? An Introduction - Who is Chris Halaby?